We were a little intimidated when we interviewed the partners at Signal Peak Ventures. After all, their business is the evaluation of other businesses. It’s a venture capital firm and they look at thousands of business concepts before choosing a handful to invest in. They also have lots of initials after their names, and went to schools like Harvard. Signal Peak engaged us to re-design their website. We recommended our Perception Branding 5d process to marry strategy together with the website design. We also interviewed CEOs of the companies Signal Peak had invested in. We discovered the trusted relationship between them. Signal Peak invests in people, not technology. It’s one of a distinctive set of values held by Signal Peak. We featured those values in the form of “trust statements” on the home page of the site we designed for them. of values that already defined the brand. A corporate brand is much more than just the outward manifestations of an organization —its name, logo, and look and feel. Rather, it is the core set of values that define it. The largest furniture retailer in the world, IKEA, builds a values-based brand both in external marketing activities and internal employee and partner relations. 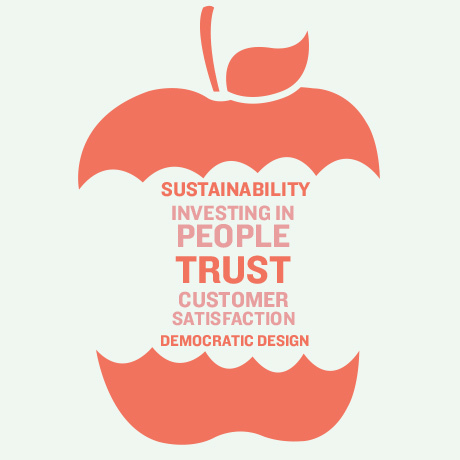 The most obvious value is what the company calls “Democratic Design”. The founder of IKEA asked, “Why must well-designed furniture always be so expensive?” At IKEA, the price tag is “designed” first, beginning with a decision on what the majority of the targeted customers can afford to pay. Further, to achieve the goal, designers work on the factory floor with the production staff. Not in a fancy uptown studio. Brainstorm, told us a customer service story that required the CEO to jump an international flight to deliver a product on time. The product was many times less expensive than the cost of the flight itself. Customers assume, without any particular evidence, that Brainstorm will go the extra mile to make sure that its products will be there when they say so. Be certain your company has a distinct set of values, and make sure those values are perceived by your customer.